Attics are wonderful places. They hold all the left-over stuff of our lives, unless one is also fortunate in having a cellar, in which case you get to collect more stuff. As soon as the Thanksgiving turkey was in the soup pot Dr. Advice led the foray into our attic to gather wreaths, bows, ribbons, ornaments and lights to brighten the season. While visiting a nice gift store in our area, the owner, who lives nearby, was pleased to see the wreaths in place, and the candy canes lining our walkway. Green boughs and red bows enliven all the doorways and windows inside, contribution of the good Dr. a true decorating demon. It took me a little longer to trim the small tree indoors. It’s always fun to unwrap each ornament and remember where you got it and how long ago. Some pieces become the worse for wear through the years, and though each year you threaten to toss those out, you never do. Memories are too precious. A couple of years ago we were guests of friends in Seattle at Christmastime. A magnificent tree stood in the corner of the living room and was covered with beautiful and expensive ornaments. It was a work of art, much like visiting a fine store or museum. Our little tree waits patiently each year to hold its small offerings and remind us of where each piece came from and which child may have made it. For our first Christmas while living in the Northwest, Dr. Advice brought home a 14 foot tree which we placed in the barn on our little farm which we used as our recreation room, where it stood tall and proud and held a number of life-sized elves made of papier mache. Alongside an antique pot bellied stove which brought cozy warmth to the space, it was a taste of an old fashioned Christmas for our California city relatives. I think our animals must think we are crazy bringing trees into the house. We have had dogs who drank out of the water containers the trees were standing in, and cats who sat quietly at our feet eating the popcorn we used to string to drape around the tree, until when we thought we had strung enough, we lifted the string only to find it empty. We are never ending mysteries to our furry friends as they are to us. My Merry Christmas gift to you is my friend Betty’s Persimmon Pudding. Don’t turn your noses up and think you won’t like it—it is NOT a steamed pudding which I wouldn’t like either. It’s more like a nut bread. I get to make this every year courtesy of my friend Judy who brings me persimmons. I made 20 loaves this year to give to friends and neighbors. Now it’s time to begin the cookie baking! 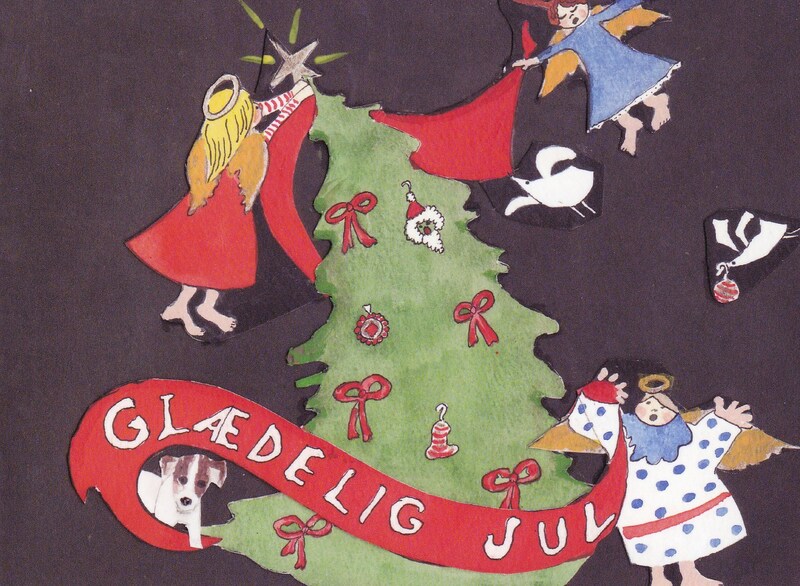 GLAEDELIG JUL! Add persimmon, and milk and mix well.